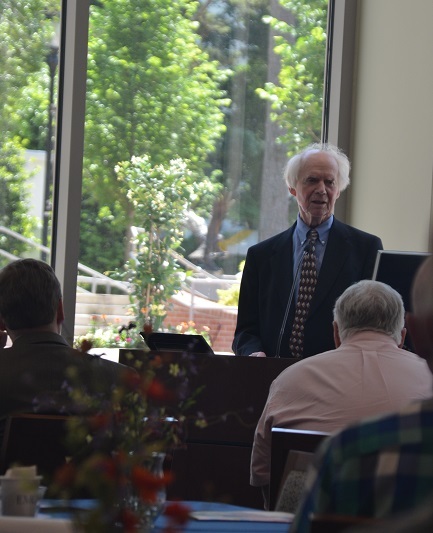 ATLANTA, Ga. — About 60 Cooperative Baptists gathered May 14 at Emory University’s Candler School of Theology in Atlanta to hear respected Baptist scholar E. Glenn Hinson and celebrate the contributions of contemplative theologian Thomas Merton. To mark the centenary of Merton’s birth, the Pitts Theology Library at Emory hosted an exhibit in honor of the theologian’s life and legacy titled “The Journeys of Thomas Merton,” curated by Emory librarian Denise Hanusek and featuring many first editions of Merton’s books, pamphlets and photography. Hinson, emeritus professor of spirituality and John Loftis professor of church history at Baptist Theological Seminary at Richmond, shared with attendees about his friendship with the American Catholic writer and mystic. As a Trappist monk at the Abbey of Our Lady of Gethsemani, a monastery in Kentucky, Merton wrote extensively on contemplation, comparative religion and social activism focusing on the need for contemplation in an active world and emphasizing the power of non-violent resistance. Merton, who continues to be an inspiration to people of all faiths and spiritual journeys, died at the age of 53 in 1968 while on a tour of Asia. On the tour, he met with the Dalai Lama and other world religion leaders. Through anecdotes of his relationship with Merton, Hinson suggested ways that Cooperative Baptists could continue to celebrate the theologian and preserve his legacy of encouraging contemplation amidst an active life. Hinson noted that the contemplative lifestyle that Merton experienced during his time as a Trappist monk was something that could reach out to people beyond the monastery walls to those living active lives. This event honoring both Merton and Hinson was sponsored by Cooperative Baptist Fellowship Peer Learning Groups (PLG) and is the first in a series of upcoming PLG-sponsored educational events. PLGs provide an opportunity for ministers to form together, shaping one another through regular opportunities of worship, spiritual formation, discussion of ministry-related issues and fellowship. There are more than 100 PLGs throughout the Fellowship. New groups are being formed and additional members are welcome. To learn more about CBF Peer Learning Groups, visit http://www.cbf.net/peer-learning-groups.